This shield is a display piece. Figures on the border symbolise Glory, Prudence, Fame and Strength. The design framework is in high relief, minutely engraved with scenes from the Iliad, Homer’s epic of the Trojan wars. Playful children and satyrs are also picked out in gold. Ghisi has signed and dated the bridge above the central battle scene. 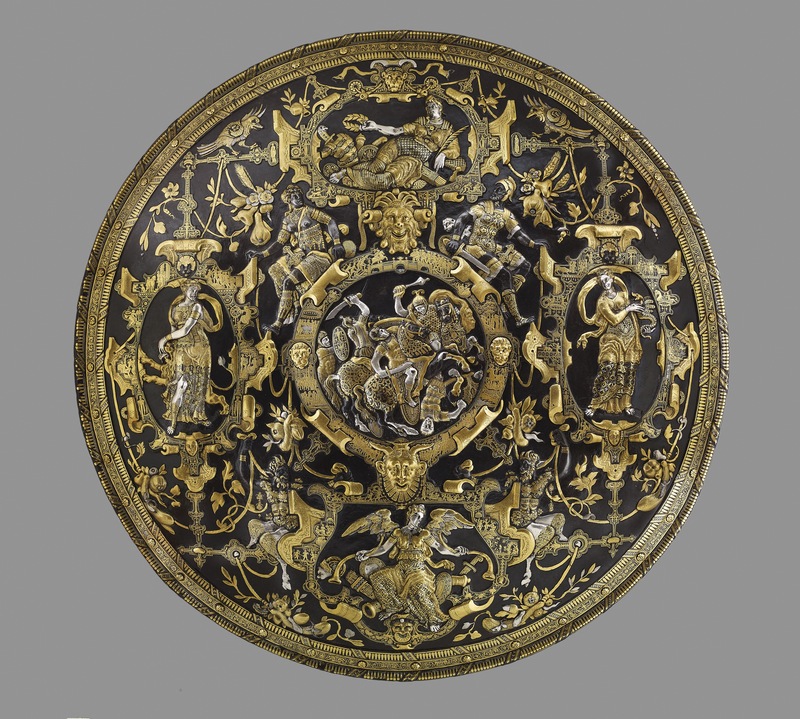 Parade shield; iron; circular; hammered in relief; damascened with gold and partly plated with silver; in centre a combat of horsemen within a frame surmounted by a male and female warrior; around are four frames containing female figures representing Glory, Renown, Strength and Prudence: each frame filled with minute subjects inlaid in gold, from the Iliad and ancient mythology; intervening space filled with festoons, monstrous figures, satyrs, fruits, etc; inscribed. This object was previously owned by Anatole Demidov, collected by Anselm von Rothschild and bequeathed to the British Museum by Ferdinand Anselm Rothschild. Provenance: Baron Anselm von Rothschild, Vienna, between 1866 and 1872 (cat no. 525), purchased at Demidov sale in 1870, by inheritance to his son Baron Ferdinand Rothschild (d. 1898). Commentary: This is a parade shield, made not for use but for display. Parade armour was a court art in the Renaissance, which bought fame to its makers and wearers. The only other signed piece by Ghisi is a (damaged) sword hilt in the Budapest Museum, dated 1570 (inventory number unknown). Dora Thornton, 'A Rothschild Renaissance: Treasures from the Waddesdon Bequest', British Museum, London, 2015, pp.318-325. For further discussion on Milanese parade armour see: J.Godoy & S. Leydi, 'Parures Triumphales, Le maniérisme dans l'art de l'armure italienne', exhibition catalogue, Musées d'art et d'histoire, Geneva, 2003, pp. 11-12.